Designed for modern capillary blood sampling, the Medlance Plus single-use safety lancet is integral to the sharps-injury prevention programs in hospitals, clinics, laboratories, and doctors’ offices. Medlance Plus provides increased safety to eliminate needle-stick injuries and cross-contamination. Ultra-sharp needle optimally positioned during skin penetration. Linear needle tracking eliminates vibrations to reduce pain and prevent tissue damage. Low triggering force ensures gentle and comfortable contact with the puncture site. Modern, ergonomically shaped safety lancet with reliable contact activation mechanism. Doesn’t require pre-loading, simplifying blood sampling. Distance between the device and finger, along with the needed pressure to the puncture site, is predetermined to ensure ultimate penetration depth control and adequate blood sample size. “Technique-independent” design ensures adequate blood flow at minimum pain level. Guaranteed to lance only one time. Single-use, self-destructing device that can’t be reloaded. Needle is concealed before and after use to prevent possible injury. Sterilized to medical industry standards for supreme safety. 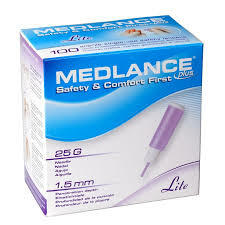 Medlance Plus Lite has a 25G needle with 1.5 mm penetration depth; ideal for blood glucose monitoring. Acti-Lance Lite has a 28G needle with 1.5 mm penetration depth. Medlance Plus Universal has a 21G needle with 1.8 mm penetration; perfect when you need larger blood samples for testing glucose, hemoglobin, cholesterol, blood type studies, coagulation, and blood gas. Gluco Navii Test Strips 50 ct.